Dog trials are popular events here in Northern Illinois and the best part of it is watching some tremendously talented dogs work. Believe it or not, shooters for live birds are hard to come by. Some folks don't like to do anything but break clays, of course, and more don't pattern their guns or spend any time learning range. It is a continuing issue, for if you don't pattern your gun at the ranges you shoot at you're just shooting blind. For those that put a huge amount of time, effort, and money into their gun dogs, they don't care to settle for anything less than dead in the air birds in field trials. Judges score the dogs on their natural abilities, including their Marking (memory), Style, Perseverance/courage/hunting, and their Trainability as evidenced in steadiness, control, response and delivery. Crippled or missed birds aren't tolerated, so if a bird gets missed or crippled a shooter often won't be invited back. While the judges and the Marshal of hunting trials are obviously experts in dog abilities, they aren't necessarily conversant with shotgun performance at all. They supply the shells, meaning you might be stuck with a chef's mix of cheap, rusty, steel based promo loads. Today, there was that, but the best that was available was 1-1/8 oz Winchester Xpert #6 Steel 1400 fps loads #WEX12H6. Believe it or not, Winchester recommends their 1 oz. 1280 fps Xpert #7 Steel loads, right on their website, for pheasant among other birds. It is sad when manufacturers publish such ridiculous shell suggestions. Anyway, price isn't the barometer of pattern quality, only patterns are, and with a Trulock Precision Hunter Improved Cylinder extended choke, this shell patterned acceptably well at 30 yards out of my Benelli Vinci. 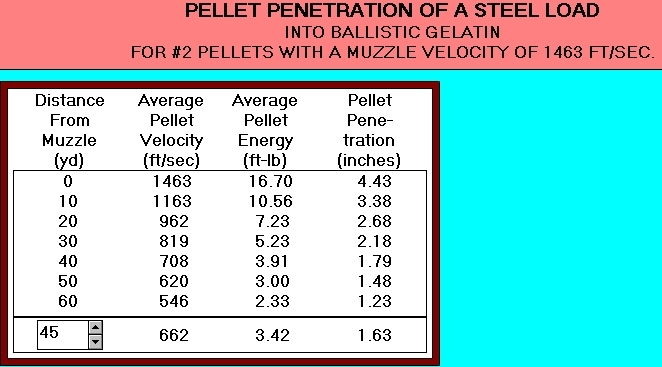 It is still horribly underpowered in terms of penetration as far as I'm concerned for wild birds or for anything past thirty yards, as you can see from the following external ballistics information comparing #6 steel, #4 steel, and #5 Kent Tungsten-Matrix loads. Number 6 steel compares poorly to a slower lead #7-1/2 target load. The #7-1/2 lead load has 150% the penetration at 30 yards, higher impact velocity, better energy density . . . clearly superior. Still, with the right choke, even crummy shells can be effective within limited range on fragile birds. For wild, mature birds at longer ranges, shells like Kent Tungsten-Matrix or Nice Shot #5 make steel look sad. Even at 30 yards, the differences are astonishing vs. a #6 steel load: 242% penetration, more than double the energy density, higher impact velocity. If it is mature, wild birds at moderate ranges, going three sizes larger with steel vs. lead makes the most ballistic sense, if you have to use steel. Kent Tungsten-Matrix and Nice Shot loads are any easy choice from a performance perspective. They are safe for "lead-only" barrels, forcing cones, and chokes as well. They are also easier on allegedly "steel safe" barrels as well. 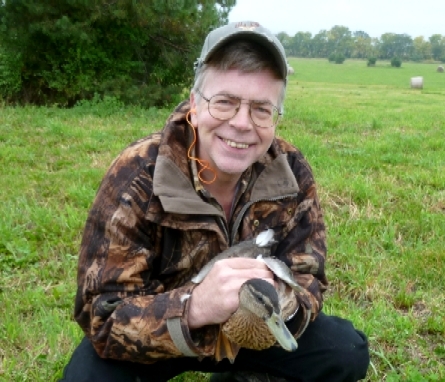 The game farm mallards used were young birds, but extremely good flyers, and the Trulock Precision Hunter IC tube had all twenty-five I shot dead in the air with one shot. No shot exceeded 30 yards, the judges and handlers were all happy with cleanly taken birds, and we got to enjoy some beautiful dogs do their thing. Hardly a challenging or sporting wingshooting endeavor, the idea is ethical quick and clean kills, a lot more ethical and quick than a bird could expect from MacDonald's, Burger King, or Colonel Sanders. Some folks still think that McNuggets grow on trees and that the poultry section of the supermarket is where they make the stuff but that isn't how the world works. Steel damage to forcing cones may happen quickly even in allegedly "steel safe" barrels. A way to minimize this is to avoid "hyper-velocity" steel loads and letter-sized steel shot. A better way is to consider Kent Tungsten-Matrix or Nice Shot, particularly taking into account the cost of replacement barrels. Much of the discussion of gauge of a shotgun is a bit silly, as it has always been a matter of the combination of shell, choke, shot density, and pattern density at a specific range that determines lethality. I'd never use a shell like this on a wild bird, of course, as even a slower #7-1/2 lead load offers 50% more penetration at 30 yards than #6 steel. We were invited back, events like this aren't about the birds at all, they are about the dogs. Still, it is a good way to look at shotshell and choke performance in a consistent environment. Trulock chokes are going the next time, of course, but there isn't much point in a minimalist penetration experiment. I'll be bringing my own shells. While steel isn't close to the best choice, the Tom Roster two-year study showed that #2 steel was superior for pheasants as opposed to #4 or #6 steel, at all ranges. If you have to use steel on wild mallards, you can expect #2 steel (111 pellets to the ounce) to be the clear choice as well. Its 40 yard penetration of 1.79 inches is no better than #5 Kent Tungsten-Matrix or Nice Shot, so in a comparison between steel against lead, Kent TM, or Nice Shot . . . going three sizes larger with steel, rather than often-touted two sizes better makes better wounding ballistics sense.